Posted on October 29, 2013 This might be outdated! I’ve been asked many times how to remove specific fields on the checkout page when the cart contains virtual (downloadable) products only. By default if the cart contains virtual products only, the shipping fields are automatically removed, but some users want to remove some of the billing fields too. That’s understandable, there’s no need to collect the billing address or the billing zipcode in most cases. The snippet i wrote below, checks the number of products in the cart, and compare the result to the number of virtual products in the cart. If all products are virtual, then checkout fields are removed, if the cart contains one virtual product and at least one physical product, checkout fields are kept. Does that make sense? The code below has a function called woo_cart_has_virtual_product(). That’s the one checking for the virtual products in the cart. It returns true if all products in the cart are virtual, and false, if none of them are virtual or if there’s at least one non virtual product in the cart. Then the second function, woo_remove_billing_checkout_fields(), is hooked to woocommerce_checkout_fields and delete the unwanted checkout fields. This is just what I’m looking for. However I’m new to this and not sure where to paste the code. (I’m using a theme with a child theme). Thanks. in functions.php in the theme folder. Can you be a little more specific for me please as I am unfamiliar with coding. Where is the folder and which at which point should I paste the code. I tried already and had to restore my site due to errors. I am using the Frisco theme. you need to paste the code in functions.php in the theme folder. opened the empty functions.php folder and copied and paste the txt. It still has all of the fields in place. is there possible to upload image, or some input text before the ‘add to cart’ button? but I’m still wondering to put it into single product page (before the ad to cart’s button) , and how about put the input field at the frontend, so the visitors could input the text or upload image if they request for custom product by them self? is there any represent plugin or addons to handle it? I have tried this code, and it does not seem to work. then the form is shorter. Could it be that the woo_cart_has_virtual_product() function does not support the current version of WooCommerce? that’s interesting, on my side it seems to work. Any ideas how I can solve it or debug it? It seems as if $is_virtual == 'yes' is never true. Yeah same here, not working. I’m on the latest version of Woocommerce. Any ideas? ‘[OBJ]_Virtual’ – where [OBJ] is a small rectangular symbol. I’ll email you a screenshot as can’t post one here. Well, I spent an afternoon on this, and have written other code that works fine for me. It has no extra function calls, which is always an added bonus. if( woo_cart_has_virtual_product() == true ) statement looks promising to modify the checkout process. Is this possible? what are the biggest stumbling blocks to look out for? To all those having problems – check that there’s not a space between the opening quote and _virtual in the get_post_meta line. Note the space between the opening quote and _virtual. Remove that and the function will work as expected. I’m guessing this is what Davido was trying to communicate but the space was stripped from his comment. Hopefully it looks right in this one! Yep, really odd. On screen there’s definitely no space but when you highlight, copy and paste there is. Just double-checked and it’s definitely there. In Notepad++ it just looks like a space, but in regular Windows Notepad it’s a strange character – OBJ surrounded by a dashed border. If it’s helpful I’m running the latest version of Chrome on Windows 7. Hi guys, yes definitely a space there. I too couldn’t get this to work until I removed the space. I copied the code from Raw – Latest version of Chrome on Mac. I’ve tried this using WP/Woocommerce and book-store responsive theme. (and the Katamo variation found at gist.githumb.com. He says: There’s an uptade for the function to check if a product is a digital variation of a standard product. https://gist.github.com/Katamo/10243188). Since I’m a reckless noob I pasted your snippet (and tried Katamo’s too) onto the bottom of the functions.php file. I still get all the required fields. Thanks for the response Remi. Crunch Press’ “book-store” responsive does not use/allow child themes. This was very surprising (and I only found out accidentally after purchasing and installing). I was able to remove fields and “required”. Is there any way to remove or disable all payment gates/payment methods for my site that only shows the catalog pages? Hey Patrick, this is clever! ;-) Well done! I’m trying to customize the templates. Can you pls advise how? Thanks for sharing! 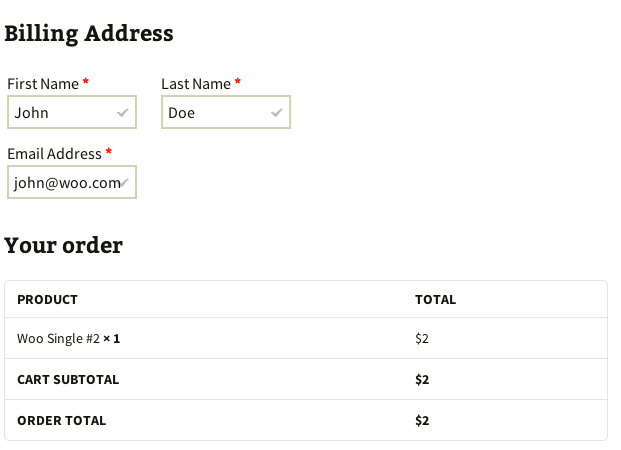 I use the WooCommerce Custom Fields Editor plugin to add a couple of extra fields to my checkout. If I wanted to target these fields the same way, how do I add them? Your code works for does not display the fields, but when the checkout process, required fields show their error message. Thanks for this code! It works a treat on the billing but I have a few additional fields from the Woocommerce checkout fields plugin that I would like removed ONLY on the virtual products. I don’t know much about code so I tried replacing the word ‘billing’ with ‘additional’ but is didn’t work. I would love to know what I did wrong and how to make this work.